To many, the purpose for having an oil pan is simply to keep the oil from running onto the ground. 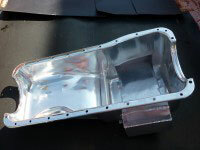 However, the oil pan provides additional functions. It allows the oil to pool at the oil pump pick up and it aids in the cooling of the oil. Many people ask to have their oil pans Teflon coated to aid in oil shedding. While a speedy return of the oil to the sump is desirable, it may not be the best way to go for overall performance. Teflon and similar materials are thermal barriers and would inhibit the pan from cooling the oil. 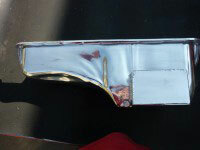 When coating an oil pan, in most applications, it is important to allow the pan to cool the returning oil. It would be better to use a coating that not only has good oil shedding abilities, but also helps rather than hinders the ability to transfer heat from the hot oil into the pan. In addition, coating the outside of the pan with a thermal dispersant will allow the pan to transfer heat from the metal sur face to the surrounding air even faster than bare metal. Painting a pan for appearance, using a typical paint, can reduce the ability of the pan to radiate heat. Chrome plating the pan simply further aggravates the problem. The solution is to use Thermal Dispersant (T.D) both inside and out. TD is oil shedding. In addition, it has excellent corrosion inhibiting characteristics and contains lubricants that reduce the ability of dirt and other debris to accumulate on the outside of the pan. This will allow the oil to return to the sump rapidly and help cool the oil as it runs over the coated surface, as TD accelerates the transfer of heat into the pan. The heat now in the pan will also be transferred to the outside air flow faster through the TD that has been applied to the exterior of the pan. The result is cooler oil. TD functions in a number of ways. First, by being applied in a very thin coat, it does not significantly reduce the surface area of the pan. Second, it contains thermally active ingredients that carry heat faster than the bare metal of the pan. The lubricants allow the oil to return to the sump faster than over bare metal. The lubricants also reduce the ability of dirt and other debris to stick to the surface. Any build up of debris will reduce the surface area of the pan and reduce its ability to shed heat. Finally, the coating is a very good corrosion inhibitor. The formation of any oxidation layer, either rust on steel or an oxidizing of aluminum, will reduce the ability of the pan to shed heat.